Don’t laugh :)! A question like “How do I put on my wetsuit?” might sound funny to you, but if you think back to your first wetsuit especially if your first wetsuit was also the first time you came in contact with water sports you were probably a little bit confused. A wetsuit is just not your everyday piece of clothing. So if you are a total beginner in the world of wetsuits and you are going to buy or rent or wear or whatever… your first one – read this and avoid chuckles from your friends! Take your wetsuit and make sure it’s not turned inside out and that the zipper is in the back. Yep this is a common mistake – zipper goes in the back, not in the front. It would be easier to zip up if the zipper would be in front so there is some logic there :) but it would not be very comfortable to lie on it. So the zipper goes in the back. The only exception are some “zipperless wetsuits” that still have a very very short zipper on your chest that opens a hole through which you squeeze into your wettie. OK, you are ready. Extend your feet so the slide easier into the wetsuit legs and slide your legs, one at the time into the wetsuit. Now pull the wetsuit all the way up to your waist. Adjust it so the wetsuit knee is on your knee, wetsuit crotch is on your crotch etc there should be no big wrinkles. This will make putting on the upper part easier. Sometimes you feel the wetsuit is to small but it’s just its all mashed together somewhere down below your waist. Pull the wetsuit up and put one of your arms all the way into a sleeve. Pull the neoprene so your armpit and shoulder fit where they should. Put in the other arm and then straighten and pull the neoprene so it is all in right place. Straighten the flap under the zipper so it doesn’t get stuck in the zipper. Use the cord that is attached to the zipper slider to close the zipper. You just pull it over your shoulder. Close the neck panel with velcro. That’s it! People always think that their wetsuit is to small when they try it for the first time. It’s just that your wetsuit should be snug, a little tight. This prevents water from entering (to much) into a wetsuit. If you would choose a nice and comfortable wetsuit that you almost can’t feel on you it would be to big. 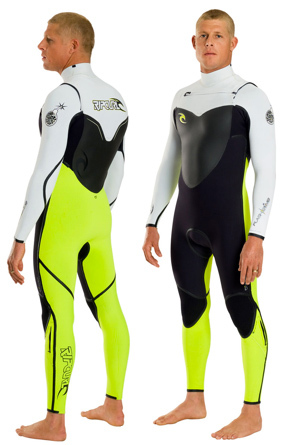 It would stretch even more in the water (neoprene gets looser when wet) and you would be swimming in your own wetsuit. No mater how good the wetsuti, it can be top of the line, the best, the most expensive… if it’s to big it won’t keep you warm. So it takes some time to get used to how to put on a wetsuit. So – to sum things up – you need to keep two things in mind – make sure all parts of wetsuit are in place, otherwise you can have excess neoprene in some parts in tight feeling in others and you will feel like your wetsuit is to small (even thoguh it won’t be). And your wetsuit should be tight (but not so tight that you can’t stand up straight or that you can’t breathe :) ). You should take some time and proof-read your written work before you use it in a business type environment. It would help give readers and visitors the impression that you know what you are talking about. There is some good advice hidden in all the mistakes though. I take a big dump in my suit to get rid of the piss smell. Wow, thanks for the tips! I am relatively new to wetsuits and I will definitely be able to put this article to good use.